This NCLEX quiz will test your ability to differentiate between metabolic acidosis vs metabolic alkalosis. You will be required to know the causes, signs and symptoms, and how to interpret blood gas values in this quiz. As a nursing student, it is crucial you know the basics about acid-base imbalances. 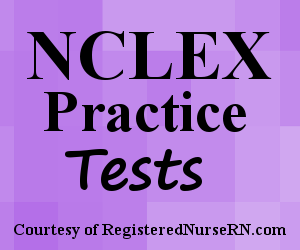 Below are common test questions you may encounter on your nursing lecture exam or NCLEX licensing exam. Also, don’t forget to take our free Arterial Blood Gas (ABGs) Quiz. This quiz will test your knowledge on the differences between metabolic alkalosis and metabolic acidosis. 1. Diabetic ketoacidosis, aspirin toxicity, and renal failure are examples of the causes of ___________________. 3. A patient is in metabolic alkalosis due to diuretic therapy. How do you expect the potassium level and bicarbonate level to be affected? 4. A patient has the following arterial blood gases: HCO3 38, pH 7.50, PaCO2 50. Which of the following signs may this patient exhibit as a compensatory mechanism? 5. What of the following is NOT a cause of metabolic alkalosis? A patient states they have been vomiting for the last 4 days. The patient is irritable, weak, and reporting muscle cramping and weakness. On assessment, the patient is experiencing bradypnea with a respiratory rate of 10. The patient has the following ABGs result: HCO3 36, pH 7.52, PaCO2 48. Which condition below is presenting? 7. Which of the following is NOT a cause of metabolic acidosis? 8. A patient reports taking Diamox and has been reporting confusion, fatigue, and headaches. On assessment, you note the patient is exhibiting deep and rapid respirations. Which arterial blood gas finding below confirms the acid-base imbalance for this patient given their symptoms and medication usage? The answer is A: HCO3 12, pH 7.19, PaCO2 29 This patient is at risk for metabolic acidosis, especially since they are taking Diamox (Carbonic anhydrase inhibitors which reduces the reabsorption of bicarb). HCO3 12, pH 7.19, PaCO2 29 are the only ABGs that reflect metabolic acidosis. 9. A patient is in high anion gap metabolic acidosis due to diabetic ketoacidosis. Which of the following signs and symptoms would you expect to see in this patient? 10. A patient has the following arterial blood gases: PaCO2 33, HCO3 15, pH 7.23. Which condition below is presenting?